VENDING!!! 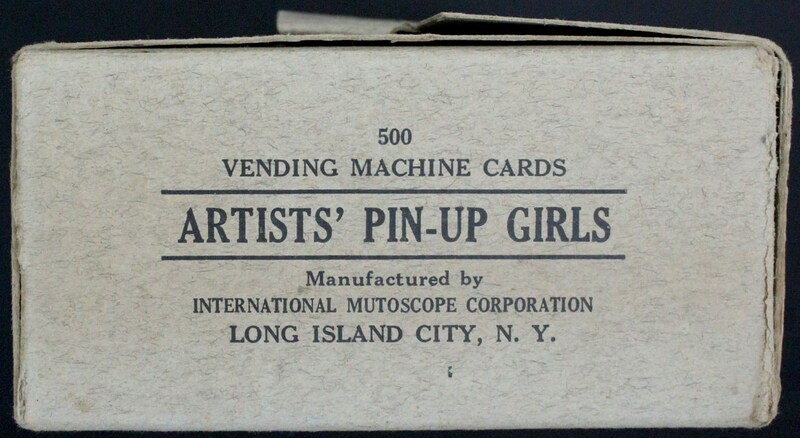 Offered in this lot is an unsearched 500 count Vending Box of 1945 "Artist Pin Ups" issued by the popular Mutoscope Corporation based out of Long Island New York. This 500 count Vending Box showcases cards with powerful deep colors and razor sharp edges and corners, with potential high grade cards throughout. Looking at the cuts, these cards appear to be in NM-MT+ condition or better. The outer box has some wear at corners, a slight tear in an opening panel but no corners splits. One amazing Vending Box offered here 73 years old. How did this Box survive the Vending Machines in the 40's?